A forum member had asked in another thread if there was a definitive list of the year-to-year changes to the Historic line. I'm sure the information is scattered about amongst numerous threads here on the forum, but finding it can be a chore. I thought it would be a good idea to try to collect the history of all changes into one thread. Once the list is complete, it can be organized into a single chart and posted on the web or possibly posted as a sticky in the Historic District. I am going to maintain a chronological history in post #2 of this thread with milestones for each year. To contribute, just reply to the thread with whatever information you have and I will paste that data into post #2. Sometimes it may be a day or so before I get around to updating the chart with the latest posts, but I'll try to keep up on it. This chronical will only be as good as the information submitted, so try to be accurate with your information. Bear in mind that often times the changes occur mid-year, so there may be some overlap. Corrections are welcome. I'll get things started with a few pieces of information that I know and then I'll rely on the group to help fill in the blanks. * First 25 Sunburst and first 15 Goldtops were painted by Tom Murphy. * Regular early 90s style cherry sunburst. * Cherry sunburst and heritage darkburst"
* Historic parts; only pickguard, pickup rings, trussrod cover. * Regular gibson usa white pearloid inlay. * "AAAA" grade soft maple top. *"Historic collection" decal still on the back of the headstock. * ID micro chip in the neck joint. * Brass bridge saddles instead of steel bridge saddles. * "AAAAA" grade soft maple top. * Brighter back cherry color. * No pointers on knobs? * "AAA" hard maple top. * new vintage taste cherry and darkburst. * Vintage style back red filler color. * Refined parts positions and neck shape. * Vintage lifton style brown case for R9/R0. * Lemon Burst, Tri Burst. * No tortoise side markers. * R9 production limited to 500 units US, 1000 worldwide due to "parts constraints"
* Vintage style mid jumbo size frets. * Very bright red sunburst. * Faded Tabacco, Iced Tea, Washed Cherry. * Genuine Kluson tuners for the early units. * Non-wire ABR-1 bridge for the early units. 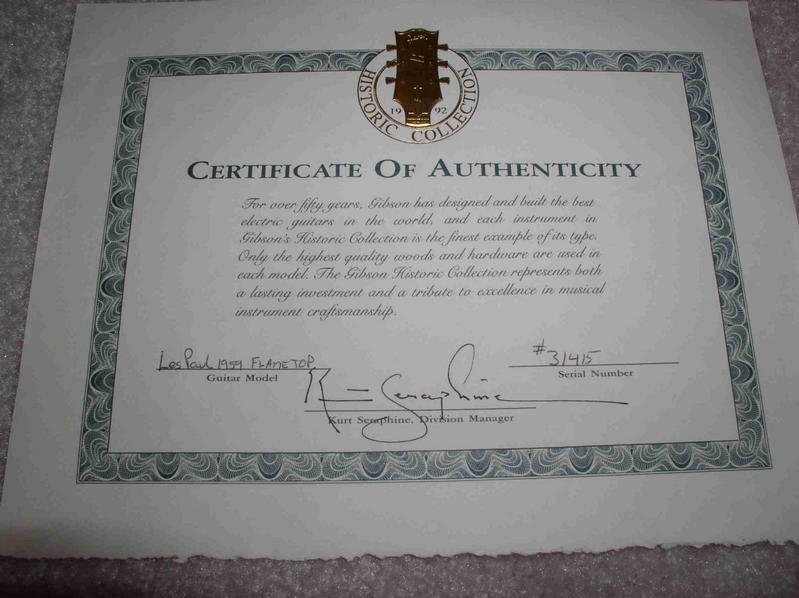 * Owners Card (listing name, serial number and the dealership), Certificate of Authenticity, Reissue Strap, an Embroidered Les Paul Swatch and a Custom Care Kit. * Burstbucker type 2 & 3. * Dark deep cherry sunburst. ** R6s and R9s Do not share with other models, so all 148 R6s and all 674 R9s are BRW. * "AA" grade eastern hard maple top. * Burstbucker type 1 & 2. * Gold knobs instead of previous vintage amber knobs. * Corrected tuner positions. "V" intead of "l l" way. * Transparent orange to regular red cherry sunburst. * "i"dot on gibson logo moved to the correct position. * New custom shop black case. * "AAA" eastern hard maple top. * Silk screened logo moved to the correct location. * Real vintage looking maple top grains/figures. * Brighter back red filler color. Note: The data presented in this list is a compilation of information found in print as well as from contributions made by LPF members. Its accuracy is not guaranteed. Last edited by alexanderja; 04-09-08 at 03:53 PM. Another great thread started by Danelectro...thanks! and thanks to all that contribute to it! Bumblebees, but don't recall the year...2003? Although I don't think these are really considered Historics, how about if we include the issue dates on these Signature models? You mentioned the flametop R8s in 1998. If memory serves, there were no R8s in 1999 and maybe also in 2000. In 2001 they reintroduced flametop R8s (sold a ton of them that year). I can't remember when they became plaintops after that. Yeah no 99 or 00 R8s! 2003 marked the year of the R8 Plaintop return, after 01 and 02 figured top R8s . The R8s became plaintops in 2003; the 2003 R9s also had distinctly less flashy tops than they had in 2002. Coincidentally or not, Gibson reduced the list price on both R8s and R9s in Jan 2003, which is pretty funny considering they also added the BRW boards then and those guitars now trade for stupid money! They differed from the 98 r8s only in the CS logo on the back of the head stock and a larger serial number. and of course only available in the lemonburst color. Open your eyes, ears and mind. Is this do-able in some way on this forum, or would it have to be done as a spreadsheet on someone's computer? 2001 R9's were the first to have the lightweight aluminum tailpiece and tortoise side dot markers among other changes that year. In 2003 the price drop was due to the down grading of the top, from a guaranteed flame top to a figured top on the R9 and a figured top to a plain top on the R8. I think the key years in spec changes are '99 and '03. The spreadsheet thing is exactly what I was after. Last edited by alexanderja; 01-04-08 at 09:38 AM. In 2002 the left handed Historics got the side dots added to the underside of the neck. So, are now like original 50s' left handed examples. Somewhere between right and wrong. The "Historic Collection" preceeded the Historic Division. IF YOU LEAVE THE HOUSE, YOU'RE JUST ASKING FOR IT! Many things became "official" during a certain year, actually had their beginings in the previous year. Tuberide has the figures for R7's R8's and R0's in a later post. Last edited by alexanderja; 01-05-08 at 05:44 PM. * Holly wood head veneer. *"Historic collection" decal on the headstock. * Left handed Historics get side dots added to the underside of the neck. * " i "dot on gibson logo moved to the correct position. The World Needs a MARSHALL ENEMA ! NYC The Greatest Country in DA World....! 2001 limited run of Brazilian board R9's given to award dealers. I'm just compiling information that has either been posted by forum members or found within articles on the Gibson website. You''ll have to be more specific about any errors and provide corrections. Are you SURE your Y2K does NOT have tortoise? Both my 99s did! Sometimes you have to shine a VERY bright light to see any red or brown!! Many LOOK black with normal light! Great list of the annual feature evolution for the Hysteric collection! But does anyone remember the year they added 'mojo' to the list of features? Mojo was there in SPADES in 93-96 IMHO!! There were 674 R9's, 256 R8's, 707 R7's, 148 R6's, 150 R4's and 163 R0's with Brazilian fretboards in 2003. This is a great thread!! when everything gets sorted this should become a sticky IMO.